'She’s my partner in crime', says Paul Feig when asked about his flourishing working relationship with comedic genius Melissa McCarthy. 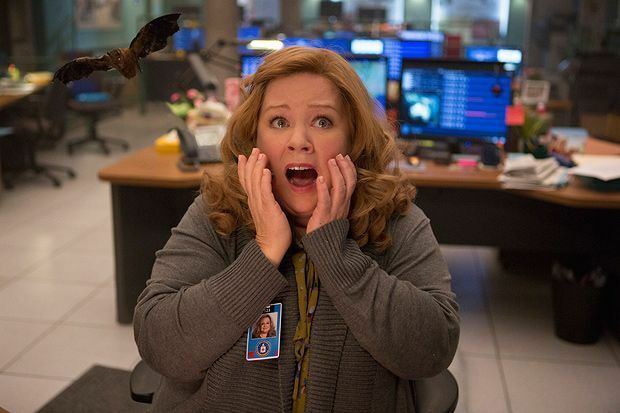 Action comedy Spy marks the third time the pair have teamed up to re-write the rulebook when it comes to female driven narratives in Hollywood and they continue to challenge the status quo with Ghostbusters which is due for release in summer 2016. Feig first encountered McCarthy when she auditioned for the groundbreaking gross-out comedy Bridesmaids, written by Kristen Wiig and Annie Mumolo. She 'destroyed' the audition and it was only then he was informed she was the wife of one of his regular players, Ben Falcone, who he cast as her love interest in the film. Feig describes the essence of Spy as 'a story of a person who nobody would think would be able to do this job. I like the idea of people who I think are undervalued because I think that's how so many of us feel at so many moments in our life.' It's a philosophy he has so enterprisingly put into action through his films in an industry where women are not only seriously undervalued but placed under ridiculously high standards compared to their male counterparts. Spy is on general release from Fri 5 Jun. Susan (McCarthy) is a CIA office worker, the support to super-spy Bradley Fine (Law); when disaster strikes, Susan's withering boss Elaine (Janney) sends her into the field. Funny, exciting and genuinely ambitious spy spoof with an appealing performance from McCarthy, and Byrne exceptional as the arrogant villainess.